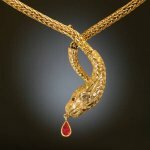 See our: serpent and snake jewelry. A lot can be said about serpents (or snakes). They have been worshipped since the Dark Ages and are a powerful religious symbol with many different meanings, like death and resurrection, while they have also been associated with healing and rivergods and also denote fertility, wisdom and the ability to cure. In jewelry serpents are depicted both for decorative as symbolic reasons. Serpent is a word of Greek origin (from the Latin serpens, serpentis) that is commonly used in a specifically mythic or religious context, signifying a snake that is to be regarded not as a mundane natural phenomenon nor as an object of scientific zoology, but as the bearer of some symbolic value. In some instances, serpents serve as positive symbols with whom it is possible to identify or to sympathize; in other instances, serpents serve as negative symbols, representing opponents or antagonists of figures or principles with which it is possible to identify. Serpents also appear as ambivalent figures, neither wholly positive nor wholly negative in valence. An example of a serpent used as a positive symbol is Mucalinda, the king of snakes who shielded the Buddha from the elements as the Buddha sat in meditation. An example of a serpent used as a negative symbol is the snake who tempted Adam and Eve in the Garden of Eden, as described in the Book of Genesis.